BMI Baby, the budget airline, will be grounded from September, with some routes being stopped from next month, owner IAG has announced. The move by the owner of British Airways (BA), which bought BMI from Lufthansa last month, puts almost 500 jobs at risk. IAG is still open to offers for BMI Baby, but expressed doubts last month that a buyer would be found. The airline, based at East Midlands Airport, is losing about £25m a year. While BMI's mainstream operations are being integrated into BA, talks are described as "positive" on a sale of its Aberdeen-based Regional division, which has 300 staff, says BBC's Scotland business and economy editor Douglas Fraser. IAG had already made it clear that BMI Baby and BMI Regional would not be part of its long-term plans. "BMI Baby has delivered high levels of operational performance and customer service, but has continued to struggle financially, losing more than £100m in the last four years," said BMI's interim managing director Peter Simpson in a letter to all staff. "To help stem losses as quickly as possible, and as a preliminary measure, we will be making reductions to BMI Baby's flying programme from June. We sincerely apologise to all customers affected and will be providing full refunds and doing all we can with other airlines to mitigate the impact of these changes." The changes mean that all BMI Baby flights to and from Belfast will cease from 11 June 2012. Services from East Midlands to Amsterdam, Paris, Geneva, Nice, Edinburgh, Glasgow and Newquay, and from Birmingham to Knock and Amsterdam, will cease on the same date. "Customers can continue to book summer holiday flights from East Midlands and Birmingham," the airline said. 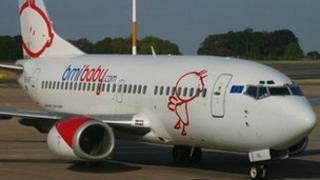 "It is proposed that all BMI Baby flights departing from Monday September 10, 2012 onwards will no longer operate."